Let's be honest. It’s often easier to criticize the outcome than appreciate the effort behind it. This past weekend, my daughter holed herself up in room for hours on Saturday, making a poster for her drama classmates. The big spring musical was that night and she wanted to give them a memory, a tribute. She painstakingly depicted each of the 30 kids as cartoon caricatures, inspired by their role in the play. Proud and excited, she brought the poster to school and hung it on the wall backstage. It didn't take long before several kids wandered over and began critiquing her drawings. “Julia, you made me look so fat,” one said. “OMG -- look at that hair. I look like I'm bald,” said another. My daughter started to tear up, hurt by their inability to appreciate her efforts in favor of their own self-absorption, albeit totally natural for most 13 and 14-year-olds. Thankfully Josh, a sweet boy who can totally rock a man-bun, saw what was going on and came to her rescue. “You guys,” he implored, “Julia worked really hard on this.” Emboldened by his encouragement, my daughter said, “Ya, I made this for all of you and I don't care what you think.” But she did. Deeply. And it hurt that no one noticed the tremendous work she had put forth. As a parent, of course, my heart hurt as I saw her pride excitement about her poster end somewhere between embarrassment and self-doubt. She's a pretty confident kid who I know will bounce back, but still, I cringed at the wound to her tender spirit. We focus a lot of our kids' accomplishments and activities. These events, however, remind me I need to double down on appreciating the effort behind the outcome and trying to grow my children to be compassionate, kind and supportive. And who can recognize and appreciate in another the tremendous effort it takes to show up in life. The HeartMath Institute in California, a nonprofit research and education organization, has actually proven that individuals who intentionally focus on appreciation or other positive emotions can boost their immune system and change their heart rhythm patterns from chaotic to smooth and rhythmic, like ocean waves. . These actual heart-monitor readouts contrast the heart-rhythm pattern of an individual experiencing frustration and then appreciation. We know that appreciate feels good but know we also know sincere appreciation actually makes us healthier! It takes a lot of courage to show up and be seen. Let's give each other the gift of acknowledging the effort. 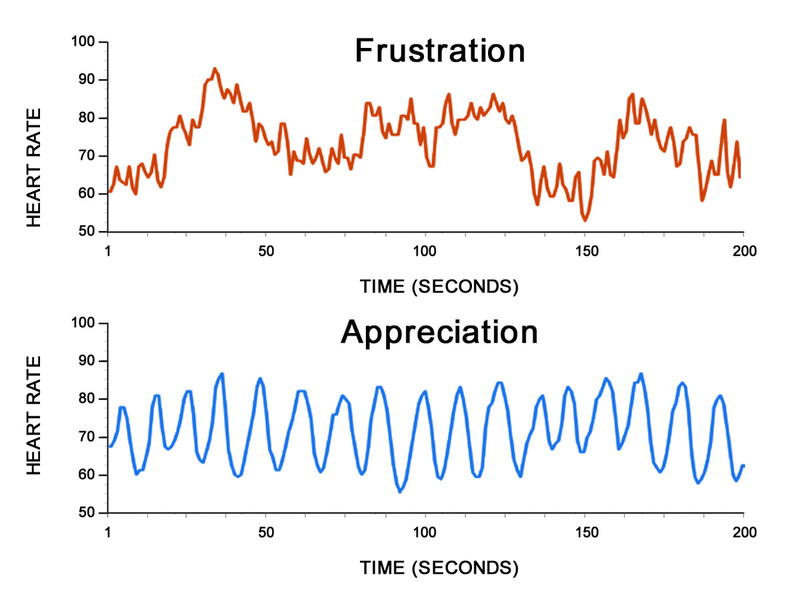 The Heart of the Matter: Appreciation is good for the heart — literally. generosity and for providing me the chance to pursue my personal chosen profession path.